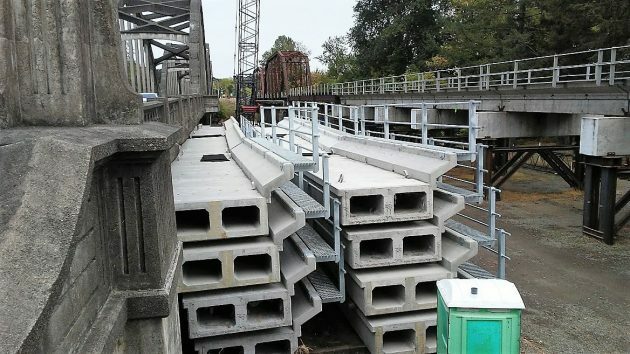 Next to the Santiam River bridge at Jefferson Sunday, pre-stressed concrete sections await installation on the UP trestle today and Tuesday. Reader Max Hoefer saw all the construction activity at the west end of the Jefferson bridge. “What is going on?” he asked. So on Sunday the Answer Man went to take a look. What was going on was the preparation for replacing the rest of the timber trestle to the west of the Union Pacific’s bridge across the Santiam River. In fact, Bob Melbo told me when I asked via email, the work at the bridge was scheduled for today and Tuesday, and again on Oct. 22-23, which means that some of the Cascades passenger trains had to be stopped in favor of bus runs. But the Coast Starlight trains — southbound No. 11 and northbound No. 14 — would be able to get through. Melbo, former Oregon superintendent of the Southern Pacific and then head of the Willamette and Pacific short line, is the state rail planner for the Oregon Department of Transportation in Salem. On the line between Eugene and Portland, the UP has been completing two or three major bridge projects a year, Melbo said. This summer the railroad replaced its trestle over Muddy Creek south of Halsey with concrete and steel. Previously it replaced a ballast-deck timber bridge near what is now Love’s truck stop, and another timber trestle over Sidney Ditch between Jefferson and Marion. Since this story appeared, I heard from Union Pacific spokesman Justin E. Jacobs in Roseville, Calif. He told me the roughly $3.5 million job of replacing segments of the trestle was being done by the UP’s own bridge crew and a local contractor. It started in June and is scheduled to be completed in mid-November. It seems a good thing that Bob Meldo and the Rail Planning Division don’t have to wait for permission from the Albany Ministry for Preservation Commission in order to replace old bridge stuff. Perhaps the idea of a freight train taking a header into the Santiam would cause a few more turned heads, as opposed to what headlines might result from tearing down former “Shooting galleries,” replacing them with modern, green buildings. ODOT has never been an agency known for quick action, but when balanced against the Albany Horological Authority, the Oregon Dept. Of Transportation appears to be approaching the Speed of Light. Maybe I wasn’t clear. The upgrading of its rail system is being planned and accomplished by the Union Pacific. ODOT obviously is informed about it but otherwise is not involved.